When last I brought out the Joey Votto Story Meter, things were looking good. I'd upped my submission batting average to a meaty .357 (10 for 28). Then, I went into a slump; the rejections started piling up. Maybe I fouled a few pitches off, but it didn't matter. The end result was an out. Then, my bat came to life. A couple of hits--paying gigs, too! 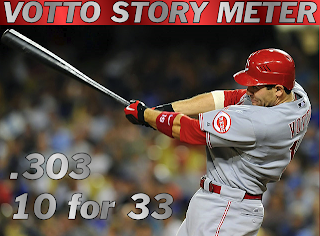 And so my average increased on the Votto Story Meter, getting me comfortably above the .300 mark. The real Joey Votto, coincidentally, is batting .338.